The Amazing Stories Behind the Best-Selling Album of the '60s! All tickets bought for this event will be for GENERAL ADMISSION seating. In Deconstructing The Beatles’ White Album Scott Freiman takes Beatles fans, young and old, into the studio with The Beatles as they create their bestselling album (and the bestselling album of the 60’s), The Beatles (commonly referred to as the White Album)—on the 50th Anniversary of its release. Released in 1968, the White Album’s thirty songs span almost every style of music—from hard rock to country to chamber music to avant garde. Its recording took place during a remarkable year in Beatles history that included the death of Brian Epstein, the creation of Apple Corps, and a trip to India to study meditation. 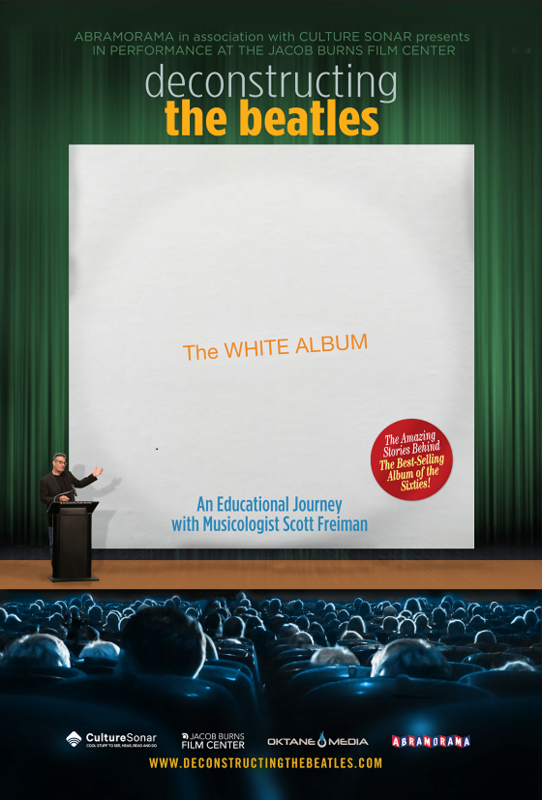 In this multimedia presentation, Mr. Freiman transports his audience into Abbey Road Studio for a look at the revolutionary techniques used during the production of “Revolution,” “While My Guitar Gently Weeps,” “Blackbird,” and other songs from the White Album. It’s an educational journey into the creative process of The Beatles’ performances and recording sessions, allowing the audience to see and hear the evolution of these groundbreaking songs and their lasting influence on popular music.